It happens that in a meeting, we are tempted to nibble something. And often, it turns out that these little cravings are not a very good choice for our health or are just not welcome during a meeting. I share here my list of foods to be banned for your next meetings. 1 – Nuts: It’s noisy (especially if you have to remove scales) and potentially deadly for some of your colleagues. Keep your nut cravings for other moments of your working day, when you are alone at your desk, as they remain a good healthy snack. 3 – Crackers/cookies: In a meeting, it’s NO! Crackers/cookies are easily compared to chips. Crick! Crack! 4 – Carrots (or any other crispy fruit/vegetable): Congratulation for the effort to choose a healthy snack. However, your carrots may disturb the concentration of people as well as chips. And this time, no one will want some. The ordeal will be endless for your colleagues. 5 – Donuts and commercial muffins: Do I have to remind you that it is not very good for your health and your waist? On the other hand, if only on rare occasions, why not! 6- Fish (and derivatives): Seriously? Fish smells are not the most appetizing. Unless you want to participate in a short meeting, we suggest you don’t bring fish. 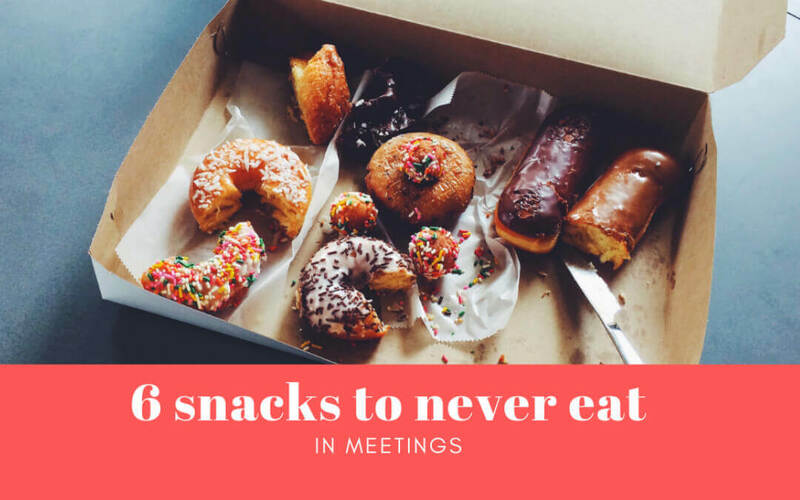 In your opinion, which snack should be prohibited at meetings? We want to know! Your comments are appreciated.